Random outages jeopardize every business’s ability to function. They significantly delay deadlines and interrupt work. They even make security systems incredibly vulnerable. The truth is that power outages affect business’s revenue streams. ITIC reports that 98% of all organizations say just one hour of downtime costs their firm over $100,000. According to a study by Inside Energy, the five-year annual average of outages doubled every five years from 2000 to 2014. So, how can you protect your business from power outage interruptions? If you don’t already have a back-up generator for your building, you can do the next best thing. Install a generator docking station, also known as a TAP box, so a portable generator can be quickly hooked up. What is a Generator Docking Station? A generator docking station connects a portable generator to the building’s electrical system without the need to run lots of cable throughout the building into the main electrical panel. It is already pre-wired, so this is the plug-n-play solution in the temporary power world. This can change the time needed to set-up and get your building power from 4 hours to 30 minutes. This is especially important in the case of an outage in certain industries such as food and data centers. 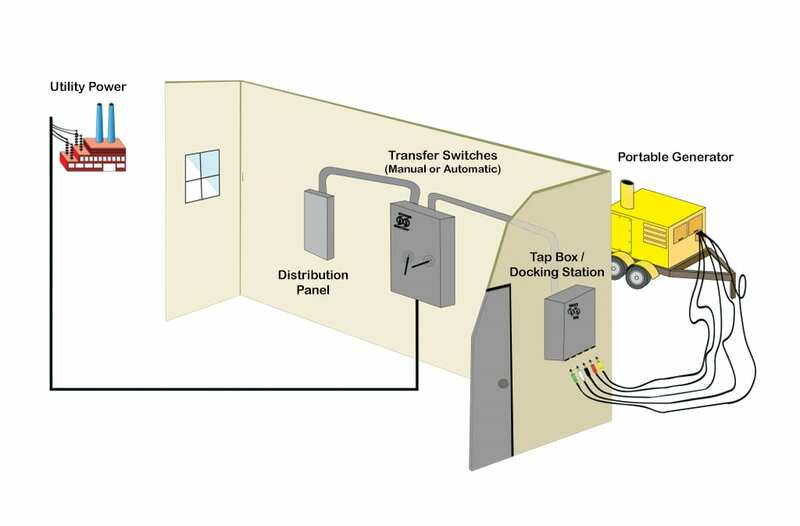 Using a manual or automatic transfer switch, the generator Tap box delivers temporary power in the case of a building-wide outage. The system keeps business functions safe and running smoothly. Generator tap boxes, are also called “quick connects” because the transfer of power is easy and smooth. They provide the quick connection of portable power right when a building needs it most. Generator tap boxes are usually installed at the side of a building, on its exterior. 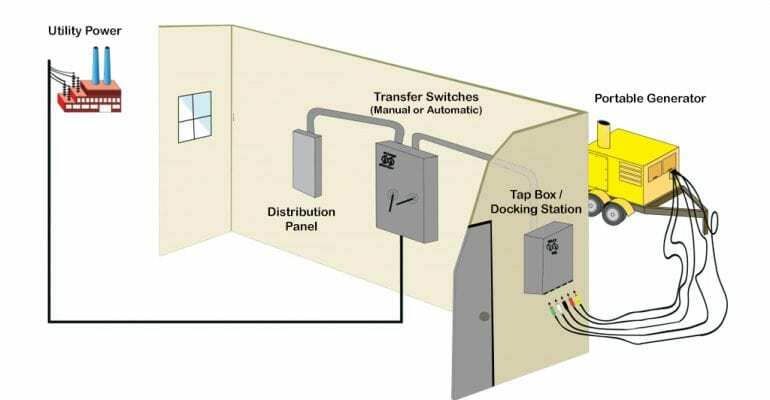 The “quick connection” of a docking station is a cost-effective method because it avoids the need to connect temporary power from the portable generator to the main breaker during an outage because it has already been done. Docking stations come with a range of custom-designed specifications and it’s up to a business or building to assess their own needs. Often, customizations include features like Cam-Lok snap covers for a “quick connection” to portable generators. Other options include short circuit protection, custom enclosure doors, phase rotation protection and more. Generally speaking, a business or building will have to write down or estimate the number of times a year they experience power outages. They should also note the location of the temporary generator and the size of the electrical load (which could end up being quite high). Critical, priority systems and the overall budget must also be considered. Think about a “continuity plan” like an “in case of emergency” box for the business. After having evaluated how many times a year an outage occurs, businesses should focus on creating a plan. It must identify risks and show how those risks will impact operations. Having a docking station in place can be part of a continuity plan that helps to mitigate those risks. Of course, even the best laid plans require stress tests and practice. Businesses should be testing the effectiveness of their generator tap boxes and keep up with preventative maintenance. That way they can make sure everything is up-to-date. The effects of power outages on businesses usually go unconsidered. This holds true until it happens, and a business is caught, like a sitting duck, in the dark throughout all of the outage. Today, practically every business increasingly relies on networks and web-based technologies. That’s why setbacks of an outage cause so many widespread problems. All these risks sound pretty scary to most businesses. The good news is that power outages are catastrophes that can be planned for. The key is preparedness and forethought. And you already know how important it is to have a business plan. Now, focus on your power plan by including a generator docking station. Contact one of our qualified sales engineers to discuss how Duthie Power Services can install your Docking Station at your facility to better prepare your business for your next power outage.